New course on Network Analysis in Python (Part 1) by Eric Ma! Networks are everywhere, and knowing how to analyze this type of data will open up a new world of possibilities for you as a data scientist. From online social networks such as Facebook and Twitter to transportation networks such as bike sharing systems, networks are everywhere, and knowing how to analyze this type of data will open up a new world of possibilities for you as a Data Scientist. This course will equip you with the skills to analyze, visualize, and make sense of networks. You'll apply the concepts you learn to real-world network data using the powerful NetworkX library. With the knowledge gained in this course, you'll develop your network thinking skills and be able to start looking at your data with a fresh perspective! 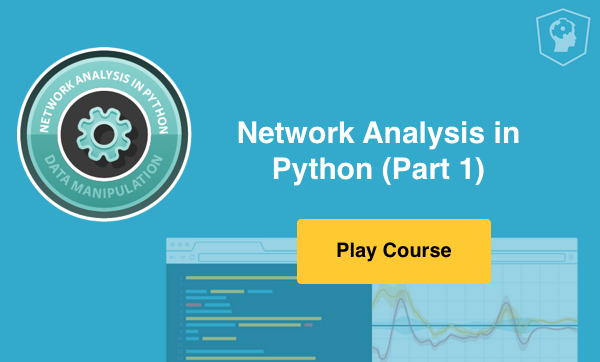 Python: Network Analysis features interactive exercises that combine high-quality video, in-browser coding, and gamification for an engaging learning experience that will make you a master network analysis in python! In the first chapter, you'll be introduced to fundamental concepts in network analytics while becoming acquainted with a real-world Twitter network dataset that you will explore throughout the course. In addition, you'll learn about NetworkX, a library that allows you to manipulate, analyze, and model graph data. You'll learn about different types of graphs as well as how to rationally visualize them. Start first chapter for free. In chapter 2, you'll learn about ways of identifying nodes that are important in a network. In doing so, you'll be introduced to more advanced concepts in network analysis as well as learn the basics of path-finding algorithms. The chapter concludes with a deep dive into the Twitter network dataset which will reinforce the concepts you've learned, such as degree centrality and betweenness centrality. Chapter 3 is all about finding interesting structures within network data. You'll learn about essential concepts such as cliques, communities, and subgraphs, which will leverage all of the skills you acquired in Chapter 2. By the end of this chapter, you'll be ready to apply the concepts you've learned to a real-world case study. In the final chapter of the course, you'll consolidate everything you've learned by diving into an in-depth case study of GitHub collaborator network data. This is a great example of real-world social network data, and your newly acquired skills will be fully tested. By the end of this chapter, you'll have developed your very own recommendation system which suggests GitHub users who should collaborate together. Enjoy!